The gap between practicing alone in your room and playing with a group in public can be a tough one to bridge. Even when a musician is ready musically, she or he often lacks the confidence, contacts, or organizational wherewithal to find musicians and assemble a group. That is why we have developed an ensemble program with over twenty different small groups at all levels from very beginning to very advanced, playing many styles---Jazz, rock, R and B , pop, and Latin. Our adult ensembles meet Monday through Thursday evenings and our Youth Ensemble Program (ages 10 to 18) meets on Sundays, late afternoon and evening. 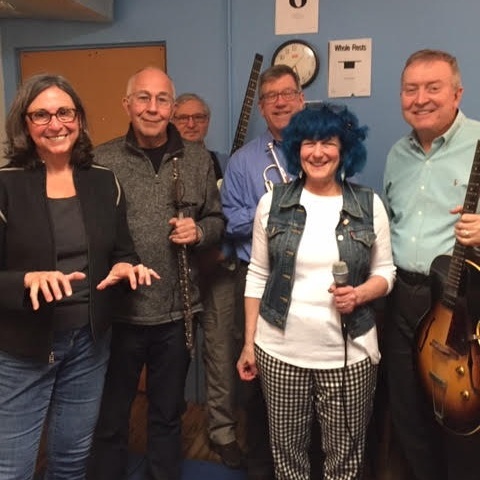 Twice a year ensembles get a chance to perform at “The Burren,” Somerville’s renowned pub. Ensembles cost $33 for each weekly 90-minute session. 17 adult ensembles meet weekly to hone their craft. Pictured is “Stoli,” directed by Dan Weiner, who have been jamming together every Wednesday night for over a decade. Read our student testimonials! Read the Top Ten Reasons the John Payne Music Center’s Ensemble Program is Stellar. Directed by Phil Neighbors, the youth ensembles are designed to inspire our students to become comfortable improvising musicians. Choice of material is tailored to the group's interests and goals. The ensembles are taught by professional musicians with many years experience with the goal of nurturing the confidence of their students in a relaxed atmosphere while they gain the valuable experience of playing in a group setting. Some of our ensembles have had opportunities to play benefit performances and even paying gigs. They all have the opportunity to play in public twice a year at our "Battle of the Student Bands" at the Burren in Somerville. Call (617) 277-3438 or email info@jpmc.us to inquire about joining an ensemble!